Update 2009: The recession and new limits on payday advance companies have been sweet news for the nation's pawn shops. No need to be embarrassed any more about visiting a pawn shop; you'll probably meet some of your neighbors there. When I was growing up, I watched a lot of Twilight Zone reruns. I developed what has become a lifelong fascination with pawn shops. In The Twilight Zone, pawn shops were places of magic and mystery, the kind of joint where you might find heaven, hell, hope, or redemption. It's where Jack Klugman dropped off his trumpet before he met the angel Gabriel, where Luther Adler found a genie who taught him to love his modest life, and where Larry Blyden died before going to hell. Pawn shops were the kind of places where anything could happen. Later on, I saw more and more of the dark side of pawn shops. Watching Brandon Lee sort through stolen engagement rings in The Crow and seeing Rod Steiger abuse his patrons in The Pawnbroker, I came to realize that pawnshops can be places of misery, where people give up pieces of themselves in order to continue financing their lives. I began to understand that pawnshops occupy an interesting place in American culture. Like the three medieval gold balls that hang in front of many pawnshops, these places have a tradition and history. They hang somewhere between hope and despair, offering the one and causing the other. Of course, most pawnshops aren't nearly as cool as the ones on the TV and in the movies. They tend to be clean, shiny, low-rent affairs, with fluorescent lighting, high ceilings, and industrial carpet. There are usually a couple of glass cases with pieces of jewelry and the occasional firearm. They're good spots for picking up used tools and DVDs, the kinds of places where you can sometimes find a great deal on some mildly threadbare merchandise. For a brief period in the late 1980's, my father used some DC-area pawnshops to raise a little quick dough, and I got a quick lesson in the economics of the pawn industry. Basically, pawnshops work like this: you bring in your items, which you offer up as collateral on a loan; in most cases, the loan will be about ten percent of the actual value of your item. If you agree to the loan, the pawnshop gives you a loan ticket. 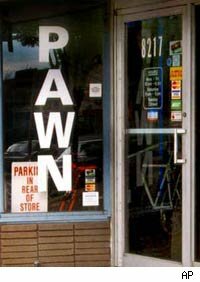 So should you use a pawnshop? Absolutely--if you're a buyer. As I mentioned earlier, they are great places to find deals, and can be a lot of fun to wander around. On the other hand, you should view them as an absolutely last resort for selling your stuff. While they will enable you to get your hands on a little bit of money very quickly, they will end up giving you a bare minimum for your goods. If it comes to a choice between selling blood, going to a pawnshop, or ending up on the street, sell your blood, then go to the pawnshop! Bruce Watson is a freelance writer, blogger, and all-around cheapskate. When it comes right down to it, pawnshops make him a little sad.